c/o Museo Archeologico Nazionale, via della Pergola 65 – 50121 Firenze. Founded by Paolo Graziosi in 1946 and edited by him in line with a programme of the greatest scientific opening towards both interdisciplinarity and different methodological approaches. The editorial policy of the journal has always been to avoid temporal and spatial limitations, in the conviction that man’s oldest history ought to be studied as a single, complex phenomenon and not broken down into separate, circumscribed sectors. In 1989, after the death of Paolo Graziosi, the journal passed into the ownership of the Istituto Italiano di Preistoria e Protostoria. In 2012 it was included by the Ministry for the University and Research (MIUR) among the A bracket journals of disciplinary area 10 (Antiquities, Philology, Literature and Art History). 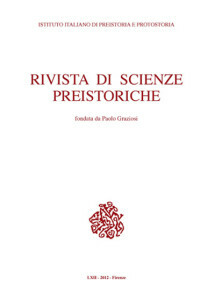 The Rivista di Scienze Preistoriche publishes memoirs and original papers in Italian and other European languages (French, English, German, Spanish), complete with captions and abstracts in English, reporting on the most important discoveries and research in the sector. It has an international circulation and it has been inserted in the European References Index for the Humanities and Social Sciences (ERIH PLUS). All papers submitted to Rivista di Scienze Preistoriche are peer reviewed in a single-blind fashion (author names are not concealed, but referee names are) by two referees. Editorial and administrative office: Istituto Italiano di Preistoria e Protostoria c/o Museo Archeologico Nazionale, via della Pergola 65 – 50121 Firenze. The complete texts of the proposed articles can be submitted to editoria@iipp.it at any time over the calendar year. However, in order to be published in the current year they should be submitted before 1 September. Following receipt of the proposal, in normal conditions the publication process should be completed within a maximum timeframe of 100 days. Upon completion of the revision and editing procedure, and following the approval to print, a digital version of the article with the assignment of the DOI will be published on the journal website. Public access to the online digital material will be on payment. At the end of the calendar year, the printed volume containing all the articles already published in electronic format will be prepared and published no later than 31 January of the calendar year following the year of the journal.